Kilimanjaro's Hermits: It's Been So Long! UPDATE POST! It's Been So Long! UPDATE POST! 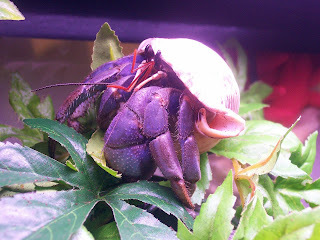 I can't believe how easy it is to forget about this blog sometimes, and even to forget about the hermit crabs! My life has been so busy with school, AP classes, Junior-year stress, college choices, career choices, working, social life, and a plethora of other things with which I don't want to bore you! I decided to do a little update because Ryukyu, a Viola I've had for a little over two years, surfaced a day ago and is looking extremely vibrant! I am proud of his new color. As for the rest of the crabs, they're all doing great. The three Straws are quite active, and Mako is as malevolent as ever! I always have to keep an eye on him. So in short, the crabs are doing great, and I will try to remember to post on here!